When nice people lose in office politics, it isn’t because their opponents are stronger. They lose because they unknowingly give away their power. 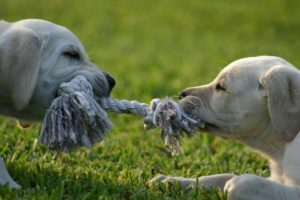 For people lacking in self confidence, winning a tug of war at the office is easier said than done. One sign is whether you’re winning hearts and minds at work. For instance, in the event of disagreements, are you able to persuade others? If you can’t persuade others even when you provide irrefutable facts, of course, you might be dealing with extremely obstinate people. It’s also possible you’re not making your case well and going about it unproductively. To use an analogy: If you’re in Los Angeles and really want to arrive in New York, don’t get in your car and drive south to Mexico. So use a road map to get you where you want to go. Candidly, as a young man long before I became a business-performance consultant, my career took off when I became a better employee. Before I knew it, I earned the right to manage others. How? Along the way, I sought mentors and used road maps for my career. Your first job is to find a mentor. Look for someone who is successful in ways you’re not. Don’t be shy about approaching someone. Chances are a prospective mentor will readily accept your request. Don’t take such a mentor relationship for granted. When you start being successful, your relationship is not finished. As Peter Drucker said, “Arrogance is being proud of ignorance.” You’re likely to learn even more from an astute mentor. Only if the person becomes too busy or your career takes a dramatic turn, you might need to find a different mentor. Make your bosses look good. Respect their positions and be loyal. Without kissing up to your bosses, look for ways to be supportive and helpful. Executives understand the value of a loyal employee. Don’t be a people-pleaser. In your interactions with others just to get along with them, avoid all gossip. Don’t participate in the spreading of rumors. Be honest and direct. You’ll develop a more positive image, and you’ll become the go-to person in the eyes of your bosses and co-workers. Extend your comfort zone. Reach out to others. That means interfacing with people in other departments as the first step in building new business relationships. Learn the landscape. Know who is truly your friend and who is your adversary. In this way, you’ll never deceive or offend the wrong people. Be loyal to your allies. Developing alliances is a two-way street. You’ll be able to rely on others, if they feel they can rely on you. Learn how to use your enemies. As the adage goes, “Keep your friends close, but keep your enemies closer.” Be sociable. Learn to probe artfully. Develop and maintain a dialogue with your enemies. You’re more likely to know what they’re thinking, and to win them to your point-of-view at crucial times. Don’t say more than necessary. Stand out by using the tool of silence. The more you say the more common and less powerful you appear to be. And you’re also likely to say something foolish, which will hurt your cause. In the heat of battle, know how to keep information close to your vest. Never reveal more than you really have to say. To use a baseball analogy, successful pitchers don’t let the batters what type of pitch is next. Don’t warn your adversaries by telegraphing your next moves. Manage your reputation. Guard it. Don’t become vulnerable. As in all sports, be defensive – protect your turf. A strong reputation is your foundation for power. In adversity, don’t let your environment define you. That means not letting others brand you. Be your own master. Re-engineer yourself, if necessary. Learn self-marketing techniques. First impressions are lasting impressions. You are judged by appearances. Be dignified in your self-promotion with charity work or working on committees. Don’t make the mistake of generating too much exposure. If you’re omnipresent, you’ll dilute your image. Never dirty your hands. Save your ammunition for important causes. Even if others agree with you on a political issue, whenever possible let them do the dirty job. If complaints are necessary to upper management, it’s better if you let others do it. Let opponents come to you. You’ll maintain your leverage of power, if adversaries feel they have to approach you first. In negotiations, usually the first person to speak eventually loses. Avoid arguments, win via your actions. The momentary satisfaction from winning a bitter disagreement isn’t worth it. Spoken words are sometimes more dangerous than actions. You’ll encounter resentments, which will last for a long time if not forever. It also demonstrates more power. Avoid negative or hapless people. It’s one thing to help others, but it’s another to get lost in someone else’s doldrums. They usually create their own misfortune with unproductive attitudes and behavior. Be gracious. Suspicious people will be won over by if you use gestures of generosity and honesty. When you need help from others, be a good salesperson. Don’t beg. Remember all decisions are based on emotion. People will respond favorably to you if they see a benefit for their best self interests. In a mammoth struggle, win decisively. Don’t leave anything undone. Don’t let fires smolder. Like a smoldering ashes in a fire, your enemy can recover. Cultivate an image of unpredictability. If your attitudes and behaviors are too familiar, your opponents will sense you’re vulnerability. Don’t isolate yourself. Be accessible. Mingle and communicate regularly with your allies. A crowd of friends help shield you. Don’t be harried in dealing with others. Maintain your independence. Don’t rush to take sides in disagreements. Know your adversaries, and allow them to be arrogant. Understand their weaknesses while appearing to be detached. Be a Columbo, the under-estimated TV character played by Peter Falk, who shrewdly solved the crimes. Expect to win, but surrender when you think you might experience defeat. The trick is to analyze early enough to save face. Never fight because of pride. Instead, surrender. It’s a tool of power when used right. As in track, plan to finish the race. A SWOT analysis will help you plan to victory. Think far ahead. You’ll be perceived as a visionary. Act as if … that means in all things appear to be natural and acting with ease. Act with confidence. Hold your head high and carry yourself well. If you act and speak with conviction, others will be convinced of your strength. You’ll enhance your image by appearing to function effortlessly without panic. Slower motion gets you there faster. Never act like you’re in a hurry. Walk slowly and speak with impeccable diction. Patience is a virtue so develop a sense of good timing. Be sure you’re right before acting and pause when the timing isn’t good. Stay calm and within yourself. Anger is never OK. Keep your adversaries at bay by staying calm. Be leery of free deals. Don’t take shortcuts. Be free of guilt and deceit by always paying your own way. Actually, by being generous, it will convey an image of authority and credibility. Don’t try to succeed or overshadow a great personality. Nothing is ever as good as the original. You’ll be overlooked and will lose your identity you’ve worked hard to build. Attack the source of trouble. Don’t get sidetracked like the fictional character, Don Quixote, who was famous for jousting at imaginary windmills. Problems are usually caused by one person. Attack the actual cause so problems don’t multiply. Carefully, be an astute advocate for change. Don’t overwhelm everyone around you by trying to innovate or change everything too quickly. You’ll appear to be power hungry. Make changes slowly. Be sure they appear to be necessary and moderate transformations. Be approachable and occasionally self effacing. People respond more favorably to people who are human – who aren’t error-free. They like people who can laugh at themselves. Such a strategy will prevent your associates from thinking your narcissistic. In ordeals, don’t over-reach. You must know when you’ve earned enough of a victory. Understand when it’s important to stop.